Defections in the NPAD have the party facing serious challenges from its own former members. The April 29 by-elections are fast approaching. Moon Jae-in and the New Politics Alliance for Democracy (NPAD) are facing significant opposition, but not necessarily from the ruling Saenuri Party. In two (out of four) constituencies up for grabs, former NPAD party members are the ones mounting the most serious opposition. 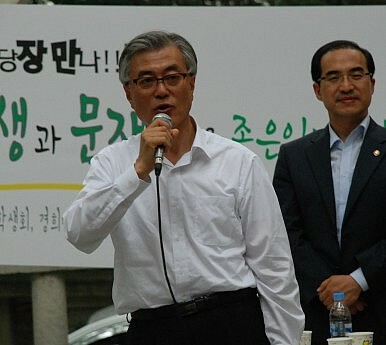 In Gwanak-B district (Seoul), Chung Dong-young, the unification minister for Roh Moo-hyun’s government, is running as a candidate for the group “Union of the People.” Chung defected from NPAD in January, criticizing the party for “swinging to the right” and abandoning the middle class. In Seo-B district (Gwangju), Chun Jung-bae (independent), a former NPAD senior advisor who left the party in March, is running against NPAD candidate Cho Young-taek. Despite a history of strong support for the liberal party, Gwangju voters have shown they are willing to vote for others. In fact, in a 2014 by-election Saenuri Party candidate Lee Jung-hyun won in Suncheon-Gokseong (a constituency in Gwangju). Both races are significant for NPAD and newly elected party chairman, Moon Jae-in. The Gwanak race is important because of Chung’s profile and what his defection from NPAD indicates. He was the 2007 presidential candidate for the liberal party and once seen as the “princeling” of Roh Moo-hyun’s government. He represents, one could argue, a significant challenge to the legitimacy of NPAD. Chung’s criticism is clear: NPAD doesn’t have the right to call itself the liberal party of South Korea. But Chung isn’t just lobbing grenades at the whole party. He directly challenges Moon Jae-in, the NPAD chairman. Chung recently quipped, “What kind of world is Moon Jae-in’s world?” Chung holds Moon partially responsible for the left’s abandonment of working people during Roh Moo-hyun’s rule (Moon was Roh’s chief of staff). He has even gone so far as to call on Moon to apologize for the failures of the Roh government. Chung’s indictment of the main opposition liberal party is unequivocal. Defeat at the hands of Chung might be interpreted by the general electorate (and NPAD lawmakers) as a popular vote of no confidence for the main opposition party. The race in Gwangju is also important. The former provincial capital of South Jeolla was a political stronghold for long-time opposition politician Kim Dae-jung and has almost always voted for liberal party politicians. JTBC portrays the Gwangju race as an “all in” situation for Moon and NPAD. Lack of party support in Gwangju is, according to JTBC, like a leaky hole in a dam; if the leak is not repaired, cracks will spread throughout and eventually lead to collapse. A loss in Gwangju, after surrendering a conservative party victory last year, would further hinder an already struggling liberal party. However, if Moon can secure support in Gwangju, then he can move on from there to build support elsewhere as he seeks to restore the battered liberal party. The outcomes in both elections will have ramifications for the future of NPAD and the presidential election in 2017 (for which Moon is, as of now, a serious contender). Surveys show that Moon’s NPAD is in need of a new election strategy. A Real Meter public opinion poll from late March shows NPAD candidates in both Gwanak and Gwangju trailing their former party compatriots. The bigger issue at hand, one might (rightfully) point out, is not how one NPAD candidate might beat a former party member. It is, rather, how the main leftist party can keep its lawmakers from breaking ranks. Until this issue is resolved, liberal party politics in South Korea will continue to struggle at the ballot box and in the National Assembly. The election of a new leader will do little to solve NPAD's woes. Ban Ki-moon Won't Run for South Korean President After AllCan a Right Wing Defector Save Korea's Liberal Opposition? An Identity Crisis for South Korea's Opposition South Korea's Opposition Gained Ground in SeptemberIs South Korea's Liberal Opposition Party About to Split?